The use of feedback from a solid-state camera located on the end of a robot's end effector (hand) or the component of a robot that comes into contact with a workpiece and does the actual work on it. The television transmission of picture images over telephone lines. Radio equipment used for the transmission of picture signals. The pigmented protein into which visual purple is changed by the action of light. Heat acts on it to produce vitamin A. 1. The quality or condition of being visual or seen. 2. That which is, or may be perceived, as by vision or sight. 1. A behavioral technique for improving performance, in which the individual is encouraged to create a mental picture of the successful execution of the task. 2. The process of viewing, or of achieving a complete visual representation of, an object as in roentgenography. 3. Making a mental image that is similar to an actual visual perception. 4. 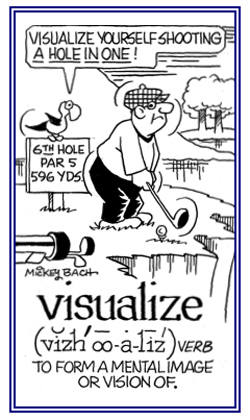 A self-suggestive technique used in psychology which involves focusing on positive mental images in order to achieve a particular goal or purpose. 5. Any presentation of data using visual images as in computer programming. 1. To form a mental image or to imagine seeing something in one's mind: When Jake was getting ready to attend a university, he was encouraged by his parents to visualize what it would be like to successfully graduate and to have a great career as a computer expert. 2. To produce an image of an internal organ or other part of the body by using X-rays or another means; such as, magnetic resonance imaging: The doctor wanted to visualize how well the patient was doing after his back operation. © ALL rights are reserved. 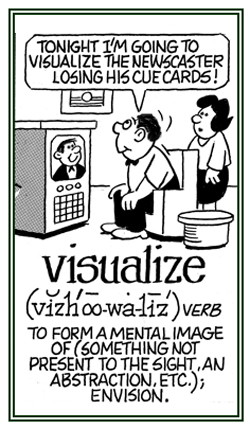 Someone whose mental images are formed chiefly by visualization or seeing something in the mind. 1. Referring to a way which is related to the appearance of something. 2. Related to something which can be seen or a way that involves looking at something. 3. In a visual manner with respect to sight; by sight. The ability to see and hear the phone when it rings. Ideal for the hard of hearing and partially sighted. The recognition, interpretation, and understanding of visual impressions. A device that measures the relative alignment of the two eyes. The area of the cerebral (brain) cortex concerned with visuognosis or the recognition and interpretation of visual impressions. Showing page 18 out of 19 pages of 276 main-word entries or main-word-entry groups.